Tektronix P6702. (No Accy's). 1300 nm, 1V / mW. Optical Electrical Converter. 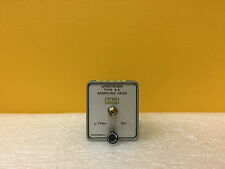 Tektronix S-4 14.5 GHz BW, 25 ps, Sampling Head. For 7000 Series. Tested! Tektronix S-4. Sampling Head. For 7000 Series Oscilloscopes. 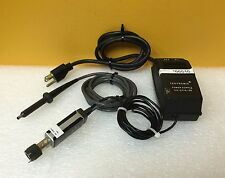 Tektronix P6202 DC to 500 MHz, Active FET Probe Assy + 119-0774-00 Power Supply. Tektronix P6202. Active FET Probe Assy. DC to 500 MHz. Tektronix P6702. 1 Volt / mW. 1300 nm, 500 MHz. Optical Electrical Converter. Includes Case. Tektronix 015-0214-00 4.2 MHz Fc, 75 Ohm, BNC, Random Noise Weighting Network. 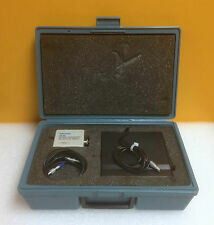 Tektronix SA-42 Kit. DC to 7 GHz Optical, 1000 to 1700 nm. 25 mW Peak Optical to Electrical Converter. Dual Interconnecting Cable Adapter Assy. Tektronix 012-0130-04. For S Series Heads. 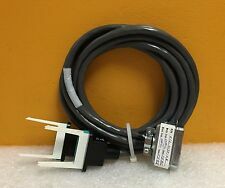 Tektronix 174-3867-00 Extension / Adapter Cable For SD-43, SD-44, ORR-24, etc. Tektronix 174-3867-00. Extension / Adapter Cable Assy. For SD-43, SD-44, SD-46,ORR-24, etc. Tektronix 011-0103-02 75 ohm, 3 V RMS, BNC (M-F) Feedthru Termination. Tested! Tektronix 011-0103-02. 75 ohm, 3 V RMS. 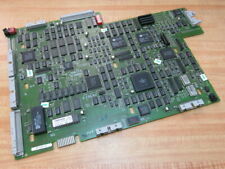 Tektronix 671-2221-03 PCB Processor / Controller Board, for TAS465, etc. For TAS465, etc. Tektronix 671-2221-03. CSA803 / 11801A. Tektronix 063-0279-02. Programming Reference. Tektronix S-2 4.66 GHz,Sampling Head for 7000 Series Oscilloscopes. Tested! For 7000 Series Oscilloscopes. Tektronix S-2 (386-1337-10). Sampling Head. 4.66 GHz Bandwidth. Tektronix 015-0352-00 250 KHz, 3V Peak, BNC (M-F) Low PassFilter. Tested! Tektronix 015-0352-00. 250 KHz, 3V Peak Max. Tektronix 011-0102-01. 75 ohm. 025%, 2 Volts Max. Tektronix P6480. Acquisition Probe. 96 Channel. State Data. TDS 200-Series. Tektronix 071-0409-00. Extension Modules. Instruction Manual. P6430 Temperature Probe. Tektronix 070-1793-00. 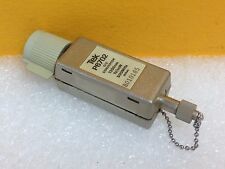 50 ohm, 10 XT, 1 Watt Attenuator, GR 874 Connectors. Tektronix 017-044. TDS 30xx Series Firmware. Tektronix 063-3141-06. Disks 1/2 and 2/2. Version 2.21. Tektronix 012-0124-00. Sampling Head Extender Module. For S Series Sampling Heads. 3' Cable L.
Tektronix P6041. Curent Probe Cable. Tektronix 062-9897-01. Sampling Head Utility Software. Ver: 1.1, SD Series. Service Reference. TDS3000 & TDS3000B. Tektronix 063-3010-02. Oscilloscope Programming Examples. Ver: 3.0, Disk 1 / 1. Tektronix 92A60. Retargetable Buffer Probe. (Includes Ribbon Cable). P6205 FET Probe. Tektronix 070-8202-01. Instruction Manual. All warranty is void if unit has been tampered with. TDS Family Digitizing Oscilloscopes. (TDS 420, 460, 520A, 524A, 540A, 544A. Tektronix 070-8709-02. ). Tektronix 92A60/90. 60 Channel, 20 MHz. General Purpose Lead Set. Tektronix P6454. Clock Probe. New Manual! TDS 500D, TDS 600C & TDS 700D. Digitizing Oscilloscopes. Tektronix 071-0504-00. Reference Manual. TDS Family Digitizing Oscilloscopes. (TDS 520A, 524A, 540A, 544A, 620A, 640A, & 644A). Tektronix 070-8711-02. Reference Manual. Tektronix 070-8995-01. 1.5 GHz, 10X Active Probe. Instruction Manual. Tektronix SF502. SureFoot Series. SMD Adapter Sets. Sets of 12 per Case. For 92A60 Buffer Probes. Tektronix MIL-1750A. Tektronix 070-7721-01. Communications Signal Analyzer. Service Manual. Arbitrary Waveform Generator. Sony / Tektronix 071-0555-00. Tektronix 070-7226-03. Sampling Head. User Manual. Tektronix 070-8286-01. Sampling Head. User Manual. AWG500 / AWG600 Series. Arbitrary Waveform Generator. Sony / Tektronix 071-0555-01. Tektronix 070-7227-02. Sampling Head. Service Manual. 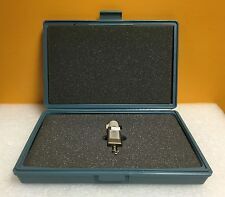 Tektronix 070-8782-02. Communications Signal Analyzer. User Manual. 1101A 1102 Accessory Power Supplies. Tektronix 070-8276-00. Instruction Manual. Tektronix 834R02A. Bisync (EBCDIC). Data Communications Tester.